These will be used in the Area Fire templates that we’ll make available for download. We will include Mike and Uncle templates, but don’t expect to use them very often! Finally, some pictures to illustrate some aspects of playing. 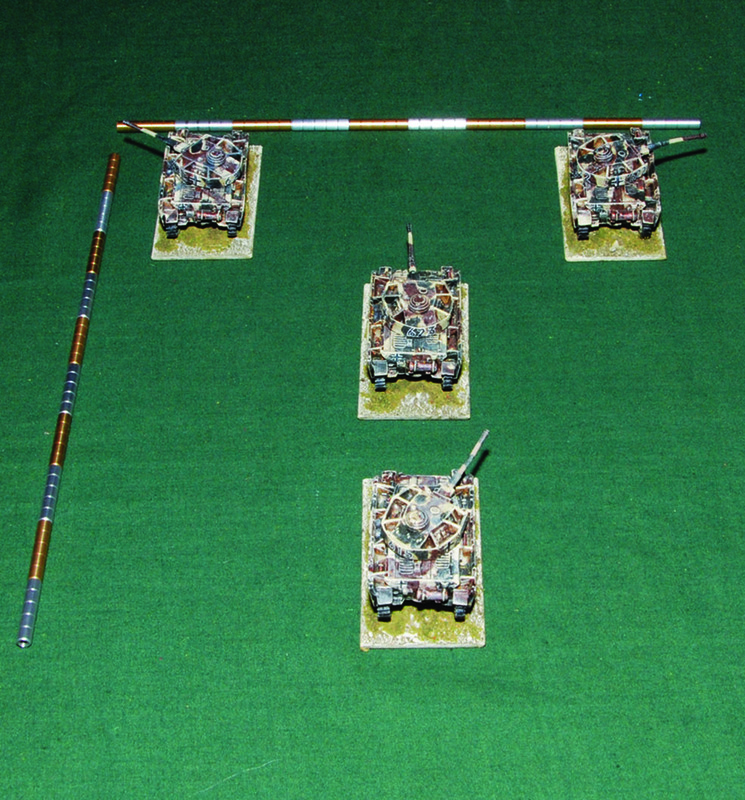 A company of Panzer IVs in “breitkeil” (inverted wedge). Note the space this formation covers, roughly 500m x 500m. This enables the rear elements space to manoeuvre against a threat without the whole company being engaged simultaneously. Each model represents an inverted V formation of (usually) 4 tanks. British infantry company in defence. It has 2 integrated infantry elements (large elements), a company HQ element (back from ruin) and 3 light supports, 1 LMG element (left), 1 PIAT element (in ruin) and 1 2” mortar element (centre). It occupies a frontage of 50cm (1km). It is entrenched in position, and each element would be connected by field telephone land lines, so all its elements can communicate. The left element (LMG) can give flanking fire to support the main central position. The 2” mortar can support the whole position, or retire if attacked. Ideally it would be supported by a further position to the rear! This German panzergrenadier company has 3 coherent infantry elements and 2 heavy support elements, 1 HMG and 1 8cm mortar. It physically occupies a frontage of 15cm (300m), but its small arms fire allows it to dominate a further 5cm (100m) each side, while its fire still remains effective out to 15cm (300m). There are many alternative formations, including echeloning elements back from either flank, attacking with 1 element leading, and deploying heavy weapons to either flank. Credits: Vicki Dalton for the explosions; Neil Ford for the pix. One of the good things about wargaming is the lack of real danger. Unfortunately for simulating war, it’s also a bad thing, because danger is a major determinant in how people react. In short, there can be a tendency to hurry in wargames, where caution would be the watchword in real life, because of the danger of hurrying. Reconnaissance and planning save lives, but wargamers (or at least hobby wargamers) want to “get on with it”, even to “get on with the game”, as if reconnaissance and planning aren’t vital parts of the event. Real danger focuses the mind. Direct personal risk of injury or death was present at all levels in World War Two, so I don’t believe that it’s a significant factor per se in the difficulties of battlegroup wargaming compared with higher or lower command levels. However, it does affect playing battlegroup wargames significantly. In our Mission Command simulation wargames we often present tabletop situations with no visible enemies, so our players have a lot of experience of not being able to see things to shoot at, or that shoot at them. For this reason, we now have much more realistically cautious players, in planning, reconnaissance and in simulated combat. In place of “I’ve rolled to spot into that piece of terrain, so I know there’s nothing there”, we now have “I haven’t searched physically through that piece of terrain, so there might be something in it.” And in place of “That AT gun shot at my tank, therefore I can quickly knock it out before it gets more shots off”, we now have “that piece of hedgerow might contain an AT gun, so I’d better use smoke or suppressive fire.” However, this does raise the serious practical difficulties I’ve mentioned earlier, and it’s only with the use of information technology – specifically very easy digital photography and printing – that we’ve engineering a relatively slick method of handling this issue in a manual wargame without recourse to poorer proxy methods such as dummy units or rolling dice. Of course, the handling of this aspect is one of the advantages of computer wargaming. Modelling the complexity of command and control at the battlegroup level is difficult, more difficult than at higher and lower levels of command. This level of command presents a set of complex, interlinked communications problems, so mechanical solutions like command points are tricky – rolling few PIPs on a d6 is a crude reflection of command problems, as is rolling a dice to see if you get artillery support. Sometimes the effect may work, but the impact of randomising away the issue is profound, if part of what we’re trying to do is to learn the nature of the problems. For example, with a randomising mechanic, it may be worth carrying out a “suicidal” attack, hoping that the opponent’s dice will fail; in the wargaming environment no harm done, but also no lessons learned. Somewhat worse, many wargaming systems will “work” using tactics that, history shows, would almost certainly fail if used in reality. In Mission Command, we attempt to model the constraints on command and communications, by organising forces using realistic information about the command structures of different national armies, by imposing appropriate delays in the transmission of information and new orders, and by reflecting tactical circumstances. But, as our players know from our early play tests, communications systems are hard to model and still have a playable game. Similarly, modelling the co-ordination of all the multitudinous different weapons systems available to the battlegroup commander is difficult, more difficult than at higher and lower levels of command. This is particularly so, because analysts and military historians are still discussing and revising our understanding of the nature of WW2 tactical combat at this command level. In Mission Command, we decided that we had to condense or abstract out much of the detail, in order to retain a sense of the battlegroup scale aimed at, but without losing what we considered to be essential elements. For example, we believed it was important to retain relatively fine-grained definition of AT weapons, lest we lose the evidentially certain impact of more advanced weapons, such as the German 7.5cm L70 on the Panther, as compared with the 75mm L48 on the Panzer IV, while we also believed that it was not necessary to include fine detail of the armour on different areas of individual tanks; our armour classes run from 1 (worst) to 10 (best). We don’t include details of whereabouts any individual tank was hit, but we have retained the basic notion that it’s harder to destroy a tank from the front. Credibility of the model is also important, in a very popular wargaming period where players can be incredibly knowledgeable. A specific problem for example was in relation to the effectiveness or otherwise of air attacks, particularly by rockets. Here we saw a direct clash between what we now know and what was thought at the time. After action operations analysis of rocket attacks, particularly during the destruction of forces in the Falaise Pocket and during the Ardennes counter-attack, demonstrated that, contrary to the claims at the time, a very small percentage of tanks was destroyed by such attacks. However, rocket-firing Typhoons are often a stalwart and highly effective air asset in World War Two wargames, and there is an expectation amongst players that they should be more effective against armour than they actually were. The situation is complicated by the tendency of inexperienced German tank crews late in the war to abandon their tanks in the face of this type of attack. For our Mission Command implementation, we have adjusted and re-adjusted values in our model, until we have a solution that maintains reasonable historical accuracy, but does not render the rocket-firing Typhoon ineffective. This satisfies the players and the designers, but it has meant balancing opposing viewpoints. When wargaming at battlegroup level, we can present our players with highly complex situations that were very challenging even for the trained, experienced and supported commanders facing them in World War Two. By doing this through good quality wargames, designers can, I believe, provide a means for gaining insights into the nature of battlegroup level warfare in World War Two. These insights can be gained through all the processes of the game – design, research and development, play and post-action analysis. I’ve been struck by the willingness of players and umpires to engage seriously over long periods with these complexities, to try out ideas both historic and less so, providing more material to aid our understanding, often through failure, which is one of the best ways to learn. History, including military history, is partly about story-telling. A compelling narrative is important to making a point, and unfortunately this can lead to inaccuracies that look like compelling truths. Much popular experience of WW2 is gained from books, films and indeed popular wargames. Taking Hollywood films as an example, simple narratives are key. A classic example is the film The Longest Day. Here we see, at Omaha Beach, that frontal assault by bravely tenacious engineers, led by charismatic officers, wins the day against the odds, whereas in reality frontal assaults invariably failed, and almost all the strongpoints were taken by infiltration through flanking areas that were undefended or poorly defended, so that the strongpoints could be taken from flanks and rear. On other defended beaches, similar tactics worked, with the addition that close-in naval gunfire and direct fire from tanks, were able to carry out the essential suppression of the defenders. This is not to question the bravery of the assaulting infantrymen, who had a daunting task, but to note that the complexities of the combat situation can get overlooked in the need for a compelling narrative, and thereby the wrong lessons are drawn. The popular wargaming audience is strongly influenced by the frontal assault narrative, which goes back through the First World War, and back to the era of the Napoleonic column attack. The WW2 Hollywood wargame needs there to be a good chance of success for the brave charge at the machine guns, and who can forget the famous Polish cavalry charge at the Panzers in 1939? For the simulation model, we need a better approach. In reality, the WW2 battlefield could look extremely bare. Even in the midst of combat, often no enemy could be seen. There are many first-hand accounts that attest to the loneliness of the WW2 battlefield, the unseen enemy, even when the enemy was actually using heavy and noisy machinery up to 3 metres in height. A simple look at pictures of concealed infantry shows camouflaged positions could be nearly invisible, even very close up and in good weather. If we add a bit of mist, rain or even the shimmer of a heat haze, we have genuine fog of war. It seems a truism then, that hidden troops and hidden movement are essential parts of wargaming. The fog of war caused by hidden troops and hidden movement is difficult to model in board wargaming, wargaming with maps and in miniatures wargaming. A popular solution within the miniatures and maps genres has been to use 3 sets of representations: one for each side and one master copy for the umpires. However, this is expensive in terms of time, resources and manpower. In many cases, and particularly in board wargaming, proxy solutions are used, such as dummy counters and hidden strengths. Proxy solutions can lead to ‘gamey’ problems, such as chasing shadows on the basis of limited evidence, rather than encouraging real life actions, such as effective reconnaissance. On the other hand, with umpires managing the fog, it is quite possible to arrive at realistically misplaced minefields and friendly fire incidents. A particular issue that is difficult to replicate in a wargame is when a unit is shot at by troops it can’t see. In first-hand accounts from Normandy, this happened commonly, but only very rarely in many wargames. There is a spotting issue: the Normandy battlefield was often very bare, and even an enemy unit firing at you might not be seen. But in a wargame, we need to represent the troops somehow; there is a strong desire to put them on into play, although in reality they are “in play”, just not visible. Particularly in the miniatures world, there is a stress on the wargame as spectacle. Miniatures games have to look good to players and potential audience, at least in part because a visible, definitive narrative is perceived to be important. By contrast a more realistic simulation wargame may often leave the defenders hidden for most of the game, and only a small proportion of the enemy may be made visible to the other side at any time. In this circumstance there is much less spectacle, though there might be more understanding of the real situation modelled. Battlefield decision-making in World War 2 was based on the assessment of terrain and other physical circumstances, the perception of enemy capabilities and intentions, and those of friendly forces. Tactical planning was traditionally derived from these assessments. Natural terrain was highly varied, and could be supplemented by extensive man-made enhancements, including concealment measures, obstacles, field and permanent fortifications, flooding, smoke, mines and booby traps. Many of these circumstances demanded specialist attention, through engineers, for example, or assault troops, specifically trained for a mission. The full spectrum of weapon types on the World War 2 battlefield included small arms and light support weapons, heavy support weapons such as mortars and heavy machine guns, tank guns, anti-tank guns, artillery and various flavours of air power. These weapon types gave troops the capability to project fire effects at different targets more or less efficiently at different ranges, through direct fire observed by the firer, and indirect fire, either observed by specialist spotters, or fired from map co-ordinates or at known positions. Air power by the end of the war gave the capability to carpet bomb large “boxes” on the ground with an effect similar to tactical nuclear weapons though without the radiation. At company level and below, it was likely that troops would use or meet at any one time, only a limited range from the spectrum of weapon types. An infantry company would not contain all these weapon systems, but only the sub-set designated for use by an infantry company, primarily small arms, light and a few heavy support weapons. It might encounter other weapon types through specific support assets for specific missions, for example from artillery or armoured vehicles. At the local level many weapon types might not be considered relevant, and modelling at this level can be considered less complex than at battlegroup level for this reason. For example, Phil Sabin’s excellent simulation Fire and Movement covers a 1943-4 WW2 British infantry battalion attack (12 rifle platoons and a machine gun platoon) against 6 depleted German rifle platoons. Weapon systems depicted include only small arms (primarily rifles and light machine guns grouped together), specialist support machine guns and off-map 3” and 8cm mortars. There is also a brief initial artillery bombardment by the attackers. The limit to the types of weapon systems included in the simulation is understandable, as it is “a simple grand tactical simulation of an attack by a British infantry battalion”, and it is designed to model “the interdependence of fire and movement” (quotes from Phil Sabin’s book, Simulating War). In support of my argument here, Phil Sabin admits that “Attacks would usually be supported by divisional artillery and by attached tank platoons, but this would add significantly to the complexity of the system…”. In fact, I think that this simulation better illustrates the style of attack at infantry company scale than at battalion or higher levels. Though the introduction to the simulation states that it focuses “on the employment of Fire and Movement tactics to exploit and overcome the terrifying suppressive effects of modern firepower”, it deliberately does not include some significant weapon systems delivering those fire effects, explicitly to simplify the simulation. Conversely at higher levels, the impact of different weapon systems has to be more abstracted in a model, because the wargame is likely to deal with the combat power of larger units, at divisional size or above. This combat power is usually represented by numerical values, and perhaps variation in movement capabilities for armoured units. At battlegroup level, capabilities and encounters would often cover the full spectrum of weapon types, with the exception of aircraft, which were generally controlled in WW2 either by independent or semi-independent air forces or by commands at army or higher level. Decisions at battlegroup level were therefore based on this full spectrum of weapon types, and it was the interplay of the weapon types and the efficient use of their combined effects that had a direct impact on the combat effectiveness of both sides and therefore on combat outcomes. At this level, co-ordination of the people with the different weapons systems was vital for maximising combat effectiveness against identified opposing people with their weapons systems. It is how to model this co-ordination, or the lack of it, that forms a critical part of the difficulty of wargame modelling at the battlegroup level. Taking the Normandy campaign as an example, both sides had difficulty getting to grips with the terrain, especially the bocage country. New units invariably went through a learning process. On the Allied side, units were either green, having arrived from the USA or been recruited and trained in the UK, or were from a very different theatre, primarily from North Africa, and experience there was of little help in Normandy. On the German side, experience was primarily from the Eastern Front against the Soviet Army, where space could be traded for time, and the nature of combat was quite different from the close terrain and restricted beachhead conditions of Normandy, coupled with overwhelming British and US air and artillery dominance. These conditions at variance from expectations led to a gap between the doctrine in the books, the training and past experience on the one hand, and actual practical application of combat capabilities in Normandy on the other. For the Allies there was an initial expectation that the Germans wouldn’t defend, or at least, wouldn’t be able to defend, right at the beachhead, so that a mobile armoured style of warfare could be adopted, where the Allies’ fully motorised forces, coupled with air power, would have the edge. When this expectation failed to materialise early in the campaign, the lack of a combined arms doctrine from the British and the lack of experience of the US troops, added to the complexity and confusion in the practical application of the various weapon systems. For the Germans, few of their troops had experience of fighting against the British and Americans – very few units had any experience from Italy, which would have been relevant, and commanders from that theatre were not used much in Normandy. They also failed to apply their own operational and strategic doctrine effectively, partly due to interference from Hitler and others in the high command. This background demonstrates the complexity of implementing combined arms combat methods at battlegroup level in Normandy, and there is no reason to believe that other theatres and time periods in WW2 were less complex. Modelling this level of complexity is problematic. If critical elements are over-simplified or abstracted, incorrect inferences might be drawn from the model. Modelling the effect of the combinations of weapon systems is necessary at battlegroup level, if we are to achieve insights from the modelling. Effects required include the destruction of vulnerable enemy forces by artillery, air power, and direct fire from tanks and other armoured vehicles; the suppression of defences before and during attack by artillery and direct fire from heavy weapons, finding out where the enemy is and isn’t (reconnaissance, including combat reconnaissance), finding and exploitation of gaps (reconnaissance and armour for speed, infantry to follow up in vehicles or not, and to hold ground), concealment (engineers, and the skilled deployment of infantry and other troops), protection from and destruction of armoured attack (anti-tank guns, hand-held anti-tank weapons, medium and heavy artillery, naval guns), destruction of infantry attacks (artillery, other support weapons, such as machine guns, mortars), defence from air power (anti-aircraft guns), creation, maintenance and enhancement of defensive positions (infantry with supports, plus minefields and other obstacles). Omitting some of these weapon systems from the battlegroup level model may result in false conclusions. For example, if we omit the use of relatively few, relatively static armoured vehicles in defensive situations from our model of late war combat, we might conclude that defensive positions can be fully compromised in depth by artillery bombardments closely followed by armoured attacks with infantry support and a sufficiency of heavy weapons for direct fire suppression. Examples from late in the Normandy campaign (Operations Totalise and Tractable) tend in that direction, and led to conclusions about the efficacy of attacks using armoured infantry fighting from within their vehicles. However, it is clear from German evidence that, wherever possible, their positions were supported with relatively few, relatively static armoured vehicles, because without these, their scanty infantry forces did crack, even though the combat power of the very small number of vehicles might seem insignificant. Different weapons systems were often in different units for command and control purposes. So, co-ordination via inter-unit communication was essential, for without this, disaster could happen. Modelling this aspect of combat is also critical. Some examples from the Normandy campaign may help to illustrate this importance. On 7 June 1944 Canadian 9th Brigade continued with its D-Day orders, despite the circumstances having changed for the following day. Their advance was a narrow one by an infantry battalion operating as an advanced guard lacking in close anti-tank gun and artillery support. Though there was a supporting tank regiment, they were late coming up, and operated relatively independently down flanking roads, but without rigorous cross-country reconnaissance or co-ordination with the infantry. Accounts of the advance guard’s fate suggest little direction from brigade or division down to battalion level, a rigid adherence to a pre-set plan and insufficient co-ordination between infantry, tanks and artillery. Anti-tank and other heavy weapons were left in positions far back, where they were unable to support forward units, and the battalion command had to rely primarily on its infantry assets, being unable to co-ordinate the other arms, owing to failures of communication (with the artillery) and control (with supporting heavy weapons). In addition brigade was not able, or was unwilling, to deploy supporting units in time to prevent the forward battalion from destruction in detail. The advance guard was badly mauled and forced back to its start line by a strong attack from elements of the 12th SS Panzer Division. Such failures of co-ordination were by no means the privilege of Commonwealth forces. The very next day, 12th SS Panzer Division’s highly rated and experienced regimental commander, Kurt Meyer, carried out a hasty night attack with a Panther battalion against the Canadians. His infantry support was limited to a small number of reconnaissance troops, because he had failed to ensure support from 26th SS infantry regiment, in front of the main target of his attack. Unsupported tanks were able to enter the target village, but lost many vehicles to accurate Canadian tank fire on the un-reconnoitred approach, and from anti-tank guns and PIATs within the built-up area. The attack was beaten off with loss. It is difficult to model these actions in wargames. Wargamers, even armchair hobbyists, are unlikely to plan operations of this nature, because they may have already read the histories. In the cold light of day, they can appreciate the risks of unsupported advances and hasty attacks. Their own experience of wargames often exceeds the combat experience of real-life commanders, but the conditions of their combats are less stressful and therefore perhaps less prone to error. Real life commanders at battlegroup level usually had some training at this level and often some experience, although the start of a campaign or the opening of a new theatre would frequently result in on-the-job learning from a low base. In most armies, training usually involved the inculcation of national doctrine. However, hobby wargamers usually don’t have this training or experience, and often have little background in military history. In addition, real commanders had more or less extensive staffs to help with planning, communications, logistics, intelligence and a myriad of other vital functions. Again, wargamers usually lack these experts, so much of the supporting infrastructure to the commander has to be abstracted in a wargame. A couple more linked elements help to explain the difficulties of the human aspects of battlegroup level modelling: preconceptions and the fog of war. I’ll address those briefly in my next post. Information could flow from sections, platoons and companies to battalion or brigade fairly quickly, owing to proximity, so decisions on action could be fast, usually verbal, and these levels of command could exploit tactical success rapidly. From there, communications upward to division and onwards were often slower. Distances were greater, the volume of information was greater, as it was coming from many subordinate units, and there was more analysis of the significance of information by staff on the way up. High command needed an overview of the situation, rather than excessive detail, so that it could give orders at divisional and corps levels, and this usually meant waiting for the big picture to come into focus. So, intervention from high command hour-by-hour was not usually carried out, and a wargame at higher command level can avoid the clutter of immediate communications friction by having longer game turns and representation of only larger scale units. Examples include, on the Allied side, the need to wait for clarity of outcomes of the initial assaults on D-Day before changing orders (Dempsey’s halt order is one example). On the German side, the whole question of tardy intervention at the level of corps and above was influenced by a perceived lack of good quality information at that level of command, and particularly by Allied deception measures. Battalion, regiment and division commanders found this extremely frustrating, because they sometimes had clear and urgent information that they were unable to impress upon higher commands. Information flow at battlegroup level was extensive. It was up, down and sideways to the flanks. Representing these information flows and their impact on decision-making at battlegroup level in a wargame model is tricky. In reality, communications took time. Either a commander or runner went to a command post to make or receive a personal briefing, often resulting in changes or clarifications of orders in response. Alternatively, telephone (landline) or wireless contact had to be made. Time was spent encrypting and decrypting messages, or in rare cases risks were run with messages in clear, using forms of verbal coding, such as code names for locations and units. Communications upwards went through many levels of the organisational hierarchy, with each level adding or taking away (or distorting) the messages, and each step adding to the time taken between initial transmission and receipt, let alone decisions on action in response. While direct communications between flanking units could be carried out relatively quickly, for example via liaison officers appointed to the task, co-ordination of the actions of units in different battalions, regiments, brigades or divisions, often required messages first going up the hierarchy, then back down a different strand of it. For example on 7 June 9th Canadian Brigade’s advance guard was unable to communicate directly with its supporting artillery regiments, and was also unable to liaise with additional available units that were not directly attached to it, because routing communications through brigade, division, corps, then to the full artillery command and control hierarchy proved impossible to carry out. This type of situation led to common difficulties in the meshing of activities at the joins between different divisions, corps and armies, and the vulnerability of troops at these joins. The British breakthrough in Operation Bluecoat was caused by a “joins failure”. In place of this necessarily imprecise and sometimes flawed communications network, wargaming can have the problem of the “bird’s eye view”, where all those involved can see much of the contextual information about the situation on the tabletop or the board without the necessity for formal communications at all. Instead of difficult communications and combinations, it is often readily obvious to wargamers what actions could and should be taken, and an informal chat – “out of game” as it were – can resolve these difficulties without the modeller’s knowledge. Command and control of subordinate units in the field was usually exercised in a formal sense, with command instructions flowing down the hierarchy, even though discussions between levels of command could and did happen. Wargaming, particularly hobby wargaming, is less serious than the real business of war, and the authority of senior versus junior commanders can be diluted, or in some cases, dissolved by the “game”. It’s rare that sanctions – such as dismissal on the spot! – can be taken, even in cases of gross violations of command and control norms, as this type of intervention by senior commanders or umpires could be seen to violate the social aspects of wargaming, and could wreck the continuation of the exercise. Even more, the changing intentions of a group of players as a team on the same side, may be continually moulded and clarified by informal commentary during the wargame, in circumstances where communication and the exercise of command and control in the field would have been impossible. It is certainly possible to address this issue by arranging for the separation of command teams, or individuals, though difficult in hobby wargames. In one of our wargaming groups, we have regularly attempted to remove commanders-in-chief from direct interaction with the tabletop, so that communications about the current situation can only be via player interactions and reporting, but this is difficult to enforce. This should be easier in a professional wargaming environment with trained military personnel. As we would expect, command, control and communications in a face-to-face wargame may be easier than on the battlefield, yet a wargame should attempt to model the real life difficulties. Typical solutions to this problem in analogue miniatures wargames have used player initiative points (PIPs), or some other method of randomising the vagaries of command, control and communications. In short, a dice is rolled or a card drawn, and the result is the activation of more or less units, or a specific but not predetermined sequencing of activation. This can reflect the inability of all units to act all of the time, or in the “right” order. However, there are difficulties with these outcome-based design solutions, because, though the effect may be to make the activity or inactivity of combat units look more “realistic”, a randomised method leads inevitably to the gaming of the probabilities concerned – “I calculate only a 1 in 6 chance of failure”, for example – rather than addressing the genuine concerns of communications, which were about both predictable and unpredictable delays, and friction caused by known factors, as well as by random ones. For example, the exercise of command and control during intense combat was more difficult than well behind the lines. A response to a request for artillery support may be delayed because of conflicting demands, but this is rather different from “I failed to roll a 5 or 6”, and seems pernicious if, in fact, the artillery was a dedicated support asset, on-call and with no conflicting demands. Continuing my battlegroup wargaming article, “The burden and rigour of battle” – for earlier ones in the series, see the sidebar. Here are few illustrative examples of what I mean about the significance of combat outcomes at various levels, drawn from the history of the early part of the 1944 Normandy campaign. The D-Day assault itself was planned at high level, and plans cascaded down to units at all levels of command prior to the assault. In terms of the fighting, it was the actions at company level and below generally that established troops on the beaches. At the initial assault stage the higher levels of command, including battlegroup level, were very much dependent on their smaller units carrying out their assigned tasks within a matter of hours and even minutes. However, I suggest that it was decisions by battalion and brigade commanders (particularly the latter) that led to exploitation with decisive effect during D-Day itself. Decisions on where to put reserves were taken at divisional level (for example 3rd Canadian Division on where to put their reserve brigade). Decisions on where to push battalions were often taken at brigade and even battalion level (for example manoeuvres on the day around Courseulles, Bernieres and inland). The timing and precise routes of commandos coming off Sword Beach moving inland were directed on the basis of leadership from officers, such as Lord Lovat. 3rd British Division, it has been argued, was hampered by the more cautious than expected approach from its battalion and brigade commanders, so it wasn’t able to follow its plan. However, it was decisions at this level that were critical. Reports that ‘enemy tanks were advancing from Caen’ were relayed back from the Staffordshire Yeomanry via 3rd British Division to 2nd British Army. The divisional commander “ordered a battalion of 9th British Brigade to hold at Perriers-le-Dan and ensure that the Sword bridgehead could not be rolled up from the west”. Despite the fact that the German attack was stopped, the reports of German tanks directly influenced Dempsey’s decision to issue the order to halt his 3 assault divisions in place at some time after 7pm, in case of further counter-attacks. Here we have an example of battlegroup level command decisions and reports directly affecting higher command decisions, at variance to the overall plan. 6th Airborne Division’s brigades and battalions were mustered by battalion as they landed on 6 June, and led off on their missions at the instigation of battalion commanders. Precise timing was decided by battalion COs (or other staff if COs were absent), using their judgement as to how long they could wait for assembly prior to moving off to their positions. It was also battalion and brigade commanders who made the decisions about the details of their deployments, within broad constraints of divisional and brigade plans, but necessarily adjusted to the real-life circumstances on the ground that were sometimes at variance with the plans. Similarly, when US battalions were landed at the wrong places on Utah Beach, it was commanders at battlegroup level that adjusted the deployments to meet reality. A potential counter-argument might be Operation Deadstick, the taking of the bridges over the Orne and the Caen Canal, which was a company level action, and was decisive. But it’s worth noting that this was a tactical implementation of a coup de main within the context of the wider Operation Tonga (the airborne landings) and subsequent vital relief operation at battalion and brigade level by 7 Parachute Battalion, 5th Parachute Brigade and commandos of 1st Special Service Brigade that converted the company level action into a firm left flank for 2nd Army. Battalion and brigade commanders made decisions on how to set up their defence within the context of the divisional plan, and brigade made decisions on how to manage reserves and switch manpower in the light of attacks. The German side also provides illustrations of the importance of this level of command, and I’ll return to these examples in the context of wargaming later. 21st Panzer Division’s activities on D-Day were heavily constrained because, in the view of regimental commander Hans von Luck, vital decisions about movement were not taken; delays were imposed by paralysis from above. But, I would argue that there is a useful comparison between the relatively supine stance of 21st Panzer Division during the morning of 6 June, and the more pro-active command decisions by 12th SS Panzer Division. The latter’s assembly was accompanied by extensive reconnaissance and planning for deployment, whereas 21st Panzer Division’s reconnaissance battalion was almost its last unit to be deployed. Management of the 21st Panzer Division’s probes during the morning and early afternoon were handled entirely at regiment and battalion level, in the absence of coherent senior direction. So, actual combat decisions were taken at regiment and battalion – battlegroup – level, while more senior commanders were critically unable to impact the combat, and I would argue it was failures at battlegroup level that contributed to the Division’s relatively poor showing. The handling of the late afternoon and early evening counter-attack was by kampfgruppe commanders, even though the main force was initially accompanied by the corps commander. Each of 21st Panzer Division’s 3 kampfgruppe had from roughly a reinforced battalion to roughly regimental strength (brigade in British parlance). In response, British defence decisions by elements of 3rd British Division and supports, were taken at the same level. These included deployment on Periers ridge, movement of supports, the balance of infantry and tanks, and assessment of threat and risk. The photoshoot was successful! Many thanks to Neil and Pete. I now have over 200 images to fiddle with. In fact, thanks in advance are due to Charlie, who will be doing the fiddling :). Our photos will be designed to illustrate the mechanics of the game. Looking at other rules I find it a bit surprising that there’s a tendency towards pretty diorama style photos that don’t really show the workings of the game, rather than illustrating how a more normal wargame might look. I suspect that’s because people like Osprey have a different focus; though Osprey does some nice drawn diagrams for their’s. Distance overlay to be added. I prefer this because it’s more active and less like a diagram than the previous one.